11 registered (Heinz, paddockman, Peter J, Paul F, John V6, SER, M3W55, Pmh44, Phil Bleazey, Hamwich, dogmog), 37 Guests and 13 Spiders online. Photos made by Cloe and Roel, alias The Car Hunter, a young couple who photograph cars as a hobby. Love the photographs Stefan - and the car - and the garage! I wonder what camera they use? The lighting is terrific. Rob has just been telling me about your cars and garage. Lovely car colour. Very nice pics. 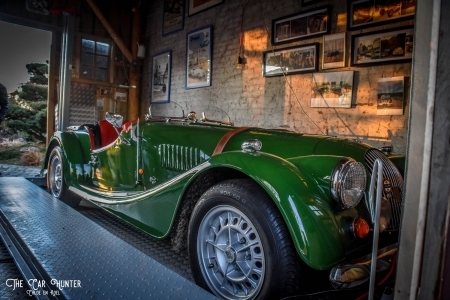 Is it your workshop (Carrosserie Streep) where all the other Morgans are photographed? I' ve seen the FREEMAN car in our village (Begijnendijk) a year or so ago.